Like its cover, Emily McKay's The Farm is exceedingly dark and creepy, filled with the kinds of vampires that are never going to make swoon-inducing heroes. The Farm reminded me somewhat of The Passage and of The Immortal Rules, both in tone and vampire-ness. In The Farm, the world has been overrun by Ticks. No, not the bugs. Humans-turned-monsters that feed on human blood. As is the case in roughly 37% of post-apocalyptic fiction, scientific research intended to help humanity accidentally got loose and turned some of the population into man-eating monsters. Oops! The road to hors d'oeuvres is paved with good intentions, right? Like in The Passage, the humans have consolidated into walled communities, carefully defended from the monsters roaming the majority of the world. Thankfully, the Ticks are not as clever as the creatures in The Passage. The difference, though, is that the humans are not behind the walls united to fight against the monsters. The people under eighteen were rounded up and stuck into these Farms, ostensibly because young, hormonal people are the most delicious and thus the most endangered. They are fed up, fattened up, and required to go for regular blood draws, this and the crazy, out-of-control vamps outside the city reminded me heavily of The Immortal Rules. Lily and her twin sister Mel are about to turn eighteen. Unconvinced that what will happen on their birthday will be at all pleasant (nobody knows what becomes of the people who 'graduate' from the Farms), Lily determines that they will escape. She prepares to trade for the final items necessary to complete their withdrawal from the camp. Everything's planned; she can keep Mel safe. Lily lives her life for Mel, her mother's last words having been an invocation to protect her sister. Mel has autism, which has not been improved by the collapse of the world as it once was. In high school, Mel was relatively high-functioning, but, now, she can no longer speak in anything but nursery rhymes, something she did as a child. Lily's love and care for Mel is powerful and touching, definitely the most powerful aspect of the book for me. Just when they're about ready to escape, enter the love interest, Carter, the only crush Lily has ever had. He was the typical bad boy and Lily's lab partner. He now seems like he could be their deliverance, if only she could trust him, which she can't do, since he obviously wants something. Though this won't make sense if you haven't read it, I have to state that I'm really not a fan of the abductura angle of the story, especially if this book is a standalone. McKay uses three perspectives to tell the story: Lily, Carter and Mel. The bulk of the narration is Lily's in first person. She has a powerful voice, and is one of those heroines that manages to be likable but not all that nice. Her sections really worked. Mel's sections, also in first person, were perhaps my favorites and I really wish that they had been longer. Mel has a unique way of perceiving the world that I found utterly beautiful. Unfortunately, she receives only about ten pages. None of her sections are above two pages. Where things go wonky are Carter's bits. For some reason I cannot even begin to fathom, Carter's sections are told in third person. This threw me out of the story every single time, because everything else was in first person and I expect that to continue. Choose one! As a result, I also didn't have as strong of a sense of Carter's character. Actually, I don't really think it was entirely necessary to have him as a POV. I think The Farm would have worked better as all Lily's narration or a more-balanced narration with just the two sisters. 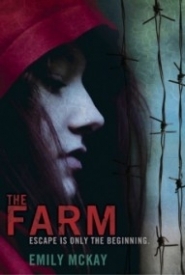 If you enjoy post-apocalyptic horror novels, The Farm will not disappoint. From what I can tell (aka Goodreads), The Farm is a standalone, but I wouldn't be at all surprised to learn that more books are coming. It could really go either way, I think, but there are subjects that have scarcely been touched on, such as the folks orchestrating the Farms (and what precisely happens there) or where all the adults are. I personally hope there's more. I came across this a while back, and was excited to pick it up. From the blurb I was curious as to what exactly a Tick was, and what they did to the humans and how Lily and Mel were going to escape it all. I got the answers, and a thrilling ride along the way. Lily and Mel have been in living on a “farm”, basically they are the food source. Lily has been taking care of her autistic twin sister Mel. Life for them isn’t easy without parents, and just being in the environment they are in. the plan that was devised by Lily to escape doesn’t go the way she planned at all, but with the help of someone from her past she gets the unwanted help she needs to try it. Lily is a character that I just adored from the beginning. She cares so deeply for her sister Mel, and does everything she does with her in mind, wanting to keep her safe is her first and foremost priority. Lily was as stubborn as they come, and at times it was annoying and I just wanted to yell at her and tell her to just be quite, I did understand her especially when Carter comes into the picture. Don’t get me wrong, he was her high school crush and he was secretive, but sweet. Intense at times, but cared for Lily and Mel. The chemistry between him and Lily was a little back and forth, and I just wanted them to give in already. It was fun to watch tough. I have to mention one of the secondary characters, Sebastion. He is a vampire and the Ticks, he was sarcastic but badass too. Can’t wait to see more of him. The story is told from 3 POV’s, Lily, Mel and Carter. Lily and Carters POV was insightful into the way they both see things a little different but it also gave a chance to see how torn they both were about so many things. Mel’s POV was a great addition, while they chapters from her were short, it showed that even though she may be autistic, she was more in tune with everything going on around her than her sister believed she was. It’s a scary time for all humans, they are being used a source of food for the Tick, who happen to be genetically altered humans that went wrong and took over. Interesting right? But that’s not all, there was good old fashion vampires in the mix too, and they weren’t happy about the Ticks either. There was plenty of action to go around, with a few small twist like the real reason Carter came looking for Mel, to the big one at the end which I kinda saw coming, but still wasn’t prepared for. Definitely made me excited for the next book. I like books about vampires and with so many out there, sometimes it is hard to find one that I really like, McKay’s take was interesting and I enjoyed them. The Farm was interesting and I really did enjoy it, the characters were great and the plot was kept my interest, what more could I ask for. The second book, The Lair, will be out in November and with that ending I am looking forward to seeing what happens with Lily and Mel. A dystopian society caused by vampires? Yes, please! It’s no secret that I’m a little (or a lot) obsessed with vampires, and my love of the Dystopia genre is steadily growing, so it’s no wonder that I loved The Farm! It even has multiple POVs which just adds to my love! The vampires are also most definitely not the good guys (with the exception of maybe one), which was an interesting and welcome change from the norm. I really admired Lily. She’s managing to take care of herself and her autistic sister, Melanie, and keep them safe from the Ticks and Collabs. She has so much strength and patience. I would never be able to handle her situation. Her major fault is that she’s too stubborn. She doesn’t want to trust anyone, but she fails to realize that she needs help to keep herself safe and therefore keep Mel safe. Her stubbornness also keeps her from listening to good advice, which at times made her annoying. It was really interesting to get Mel’s POV, too. She see things quite differently than her twin, but she understands more than Lily gives her credit for. She’s a musical savant, so she often describes things in terms of music in her head, but she has trouble verbalizing her observations to Lily. Sometime it was difficult to understand exactly what she meant, but her insight was definitely appreciated. Finally, we have Carter’s POV which is annoyingly in third person. It seems like more and more authors are choosing to do this first-third flip-flop, which is frustrating. I hate it, but at least Carter’s chapters were interesting. Right off the bat we learn that he’s “playing” Lily and he knows stuff about her that she doesn’t even know about herself. I love how Carter and Mel’s chapters add things that Lily is blind to, especially since she’s our main heroine. As for the world, it’s dark and dangerous. There are “farms” set up all across the country that essentially round up teenagers as cattle for The Ticks, vampires gone wrong. They apparently like the taste of teens the best because they have just the right hormone levels. No one knows what happens to the adults, and Breeders are safe, since pregnancy hormones are unpalatable. It’s all very scientific which I admired and loved! The first 250 pages take place in one day. It’s a super action packed, adrenaline filled day. There’s so much tension as Lily tries to escape the Farm with her twin and Carter. But getting on the other side of the fence doesn’t mean they’re free, in fact, there’s even more danger in the abandoned regions of the countries. Then that ending…woah! The Farm is an intense read.